Surat Thani Airport has two main types of customers – Thais heading to the provincial capital in Southern Thailand for business or to visit relatives, and tourists taking advantage of cheap budget carriers to travel the length of Thailand quickly and cheaply. These tourists normally head off to the islands in the Gulf of Thailand or to Khao Sok National Park. The flight from Bangkok to Surat Thani Airport costs as little as 1,500 Thai Baht. Considering the bus or train costs at least 1,000 Thai Baht for the same journey and takes an overnight journey the flights seem great value. The main downside of Surat Thani Airport from a tourist point of view is that it is a long distance from other destinations. It is 30 minutes to Surat Thani City or 1 hour and 30 minutes to the port of Donsak where the Raja Car Ferry sets sail for Koh Phangan. Moreover, the added journey adds more expense. For those determined not to use the over-priced Thai Airways that fly into Koh Samui Airport the recent fly and ferry deals offered by Lomprayah and other travel firms offers quicker journey times than the bus or train and up to 2,000 Thai Baht in savings. Unfortunately, landing in Surat Thani Airport rather than Koh Samui adds at least 3 hours onto travel times. This is where Koh Phangan Airport comes in. Kan Air claims it will be offering flight prices much lower than Thai Airways. For those wanting to get between Bangkok and Koh Phangan quickly the airport becomes very interesting. While it might be more expensive than taking an Air Asia flight to Surat Thani Airport the time spared means the Kan Air Flights are likely to quickly fill up. This is especially true during the Full Moon Party when many people just want to go to Koh Phangan for the epic night of the party but have little interest otherwise in staying on the island, or they are short on time. All this means that if Koh Phangan Airport is ever finished it is likely to impact on the profitability on air routes between Bangkok and Surat Thani Airport. People have pointed out how the proposed airport will rival Koh Samui Airport, less have seen that the greater rivalry is between Koh Phangan Airport and Surat Thani Airport. 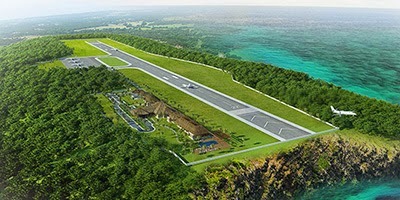 However, this is all hypothetical until Koh Phangan Airport is actually operational. They are a long way off completion.